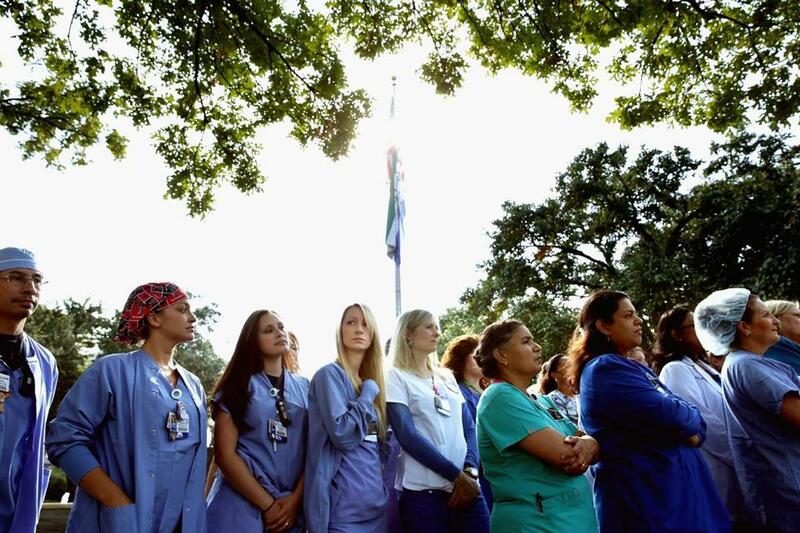 Nurses from Texas Health Presbyterian Hospital in Dallas gathered on Monday to show support for their employer. DALLAS — Giving this city a measure of calm for the first time in weeks, 43 people who had direct or indirect contact with the Liberian man who died here of Ebola were declared Ebola-free Monday. The 43 people who were released from monitoring had all been potential contacts of the Liberian man, Thomas Eric Duncan, before he was admitted to Texas Health Presbyterian Hospital on Sept. 28. Ultimately, a total of 48 people are expected to be cleared of any risk of contracting Ebola in the coming days and will start rebuilding their lives, after a 21-day isolation that amounted to a self-imposed quarantine for some of them and a more serious state-ordered quarantine for others. The news came as federal officials announced new guidelines for the protection of hospital workers caring for patients infected with Ebola — guidelines that might have prevented the infection of two nurses had they been in place a month ago. The new guidelines, from the Centers for Disease Control and Prevention, are based on the very strict protocols used for years by Doctors Without Borders, Dr. Thomas R. Frieden, the CDC’s executive director, said during an unusual late-evening telephone news conference on Monday. Among other changes, the officials say, no skin should be uncovered, street clothes and shoes should be replaced with waterproof fabric and boots, and every step of putting on and taking off equipment must be done under the watch of a supervisor whose job is to prevent mistakes. The procedures were reviewed by Doctors Without Borders, a medical aid group based in Brussels, and by specialists at the three American hospitals that have successfully cared for Ebola patients — those at Emory University, the University of Nebraska, and the National Institutes of Health. The guidelines represent a recognition by the CDC that Ebola victims require precautions quite different from those taken for airborne diseases like SARS, MERS, avian flu, or tuberculosis. It has never been proved that victims infected anyone by coughing or sneezing, but they emit copious amounts of highly infectious vomit, blood, and diarrhea, so it is crucial that not even a speck of it gets into a medical worker’s eyes, mouth, nose, or cuts. The most difficult and dangerous part of the process, experts agree, is removing safety gear when infectious particles cover its surfaces. There are some differences between the CDC guidelines intended for American hospitals and those of Doctors Without Borders, which treats Ebola patients in makeshift field hospitals in Africa, some of which are tents built on open ground. For example, Frieden said, in Africa it is possible to spray nurses and doctors down with a chlorine solution as they stand in a gravel pit. That would create slippery puddles in a hospital corridor, so the guidelines recommend bleach wipes. Before the CDC announced the guidelines, city officials in Dallas, local philanthropists, and Wilshire Baptist Church were working to donate money to Duncan’s fiancée, Louise Troh, and her family for new housing, clothing, and other items, now that they were found to be free of Ebola symptoms. “There’s no question today is a milestone day,” Mayor Mike Rawlings said Monday. He spoke for the first time of another “magic date” that officials were now focusing on: Nov. 7, when all of those who are still being monitored in Texas, including dozens of nurses and other hospital workers, will have passed the 21-day maximum incubation period for the virus. The mayor’s remarks came the day after the family of one of the infected nurses at Presbyterian hospital, Amber Joy Vinson, 29, said she had received permission to fly from both the CDC as well as Dallas County. A member of the family’s legal team said Vinson had even asked Dallas County health officials for a private plane, but officials assured her that her concerns were unfounded. Vinson was away on a personal trip to her hometown in Ohio when she learned that a co-worker, Nina Pham, had tested positive for the deadly virus, the member of the family’s legal team said.